Former Army Chief Cruises To Win In Egypt's Presidential Election : The Two-Way Abdel-Fattah el-Sisi "won by more than a landslide, taking at least 93 percent of the vote," reports NPR's Leila Fadel from Cairo. A picture taken in Cairo shows ballots sitting on a table as polling station officials count votes in the country's presidential election. Former army chief Abdel-Fattah el-Sisi is projected to be the overwhelming winner. Egypt's former army chief Abdel-Fattah el-Sisi will be its next president, according to preliminary results from the country's three-day election that was held this week. 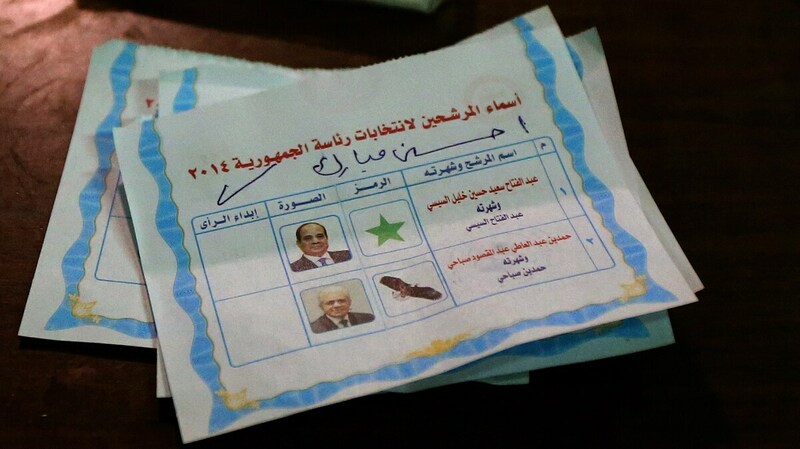 The overwhelming victory for Sisi over left-wing candidate Hamdeen Sabahi had been widely expected. "Sisi won by more than a landslide, taking at least 93 percent of the vote. His opponent got only 3 percent — less than the 3.7 percent of people who spoiled their ballots, according to a judicial source in the electoral commission. "Sisi's win was expected; the bigger concern was turnout. The electoral commission extended voting by a day, due to apparent concern over the lack of voters. The bigger the turnout, the bigger the endorsement of Sisi and the wide crackdown that this election is taking place in. "According to judicial sources in the electoral commission, about 46 percent of registered voters turned out — less than the about 52 percent that turned out in the 2012 presidential elections in June that brought Islamist Mohammed Morsi to power before he was overthrown last summer." An EU group that monitored this week's vote has declared that the election took place under "democratic and free" conditions, reports Egypt's official newspaper Al Ahram. But another European official who witnessed the vote also says the presidential vote wasn't necessarily fair, citing the "self-censorship practiced by many media outlets," according to Al Ahram.